Another beautiful weekend up here on Vancouver Island. That makes up for the 21″ snowfall we had last month. Must say however that they did forecast the storm quite well. We should be as accurate. So it’s the weekend. Mixed into handling the usual spring clean-up we find time to go through our “routine”. In this weekend’s first step in identifying commodities of trading interest we ran across the following MarketProfile screenshot. Again, the important words from above are “routine” and MarketProfile. Fifty plus years of “perfecting” a routine pays off. Knowing what to start with one gains an immediate appreciation of MarketProfile, the first of the AMS DeltaPrint (c) Suite of tools we employ. In my humble opinion I think it’s the best. We review an armada of potential trading candidates each weekend. We look for what is shown above. Coffee is more likely closer to a bottom than a top. Technically speaking the horizontal histogram (orange thing on the right hand side of the chart) is talking to us. It’s a trading range with a potential (candlestick wise) double bottom, perhaps soon a triple bottom. 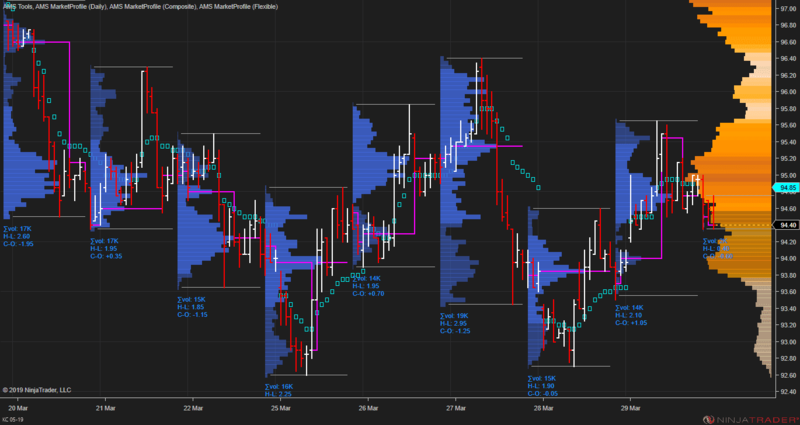 Using MarketProfile makes the first part of our weekend “routine” easy. Give it a try and I think you’ll agree.